UPDATE: Occupation of Great Hall now suspended – meet 6pm instead at Portland Building. 03/11/2010. The occupation of the Great Hall in the Trent Building at University of Nottingham continues into its second day and more people are invited to get involved in the day, to stay over night or both. People are currently free to come and go. There have been meetings and lecturers speaking on various subjects. There is a quiet study area, huge meeting area and some free food. Amongst the things occupiers are asking for are stationery and art materials, films on DVD, internet (GPRS) dongles, games, more food, microwave cookers, blankets and heaters. If you are going take warm clothes and a sleeping bag plus blankets. See website ‘Nottingham Students Against Fees and Cuts!’: http://nsafc.wordpress.com/ for the latest news and more about events that have taken place so far, and what is planned for the rest of the week and beyond. Download PCS union letter of support: [Word format] or [PDF format]. We are aware that a group of students has occupied the Great Hall in protest over the planned increase in tuition fees and proposed cuts to HE funding. We share similar concerns about the financial cut-backs in Higher Education and urge you to engage with the students constructively and treat their concerns seriously. Students at Nottingham University have occupied The Great Hall in The Trent Building on University Park. 1. We demand that the University of Nottingham lobby the Russell Group and the government and issue a statement condemning all cuts to higher education, the EMA and the rise in tuition fees. 3. 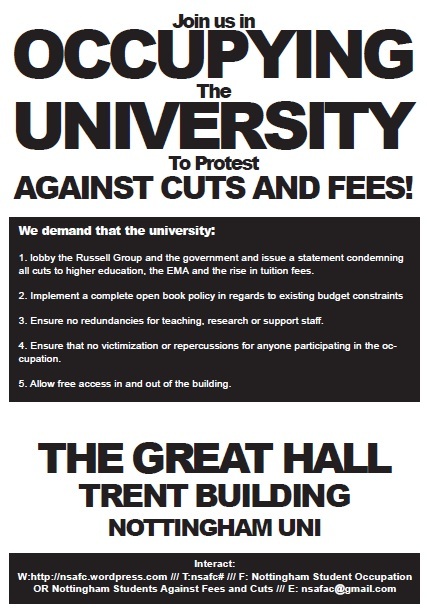 We demand that the University of Nottingham ensure no redundancies for teaching, research or support staff. 4. Ensure that no victimization or repercussions for anyone participating in the occupation. 5. Allow free access in and out of the building. Elsewhere in the UK …. This entry was posted in Events & meetings, Road to success and tagged education, occupation, video. Bookmark the permalink. Keep an eye on twitter feed NOTTINGHAM STUDENTS TWEETS http://twitter.com/nsafc as the Registrar has said that student must leave the occupation by 4pm, or else action will be taken on those that remain. Come and support the occupation now, either on the inside or outside of the Great Hall. Just having witnesses will be useful in case people get pulled out by the hair like they did on the Gaza occupation previously.